Women artisans in India string beads wrapped in repurposed textiles onto a delicate gold metallic chain. Your junior high candy necklace gets a sophisticated upgrade with this sweet piece. 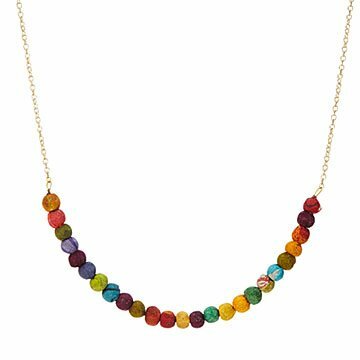 Women artisans in India string vibrant kantha beads—beads wrapped in repurposed textiles—onto a delicate gold metallic chain that's an ideal length for layering with both longer and shorter necklaces from your jewelry box. It also stands on its own, adding a pop of color against a classic white tee. Handmade in India. Kantha beads are made from repurposed textiles, so each necklace is one-of-a-kind. Had hoped it would be more colorful. It was very dull and the chain looked cheap. I will probably never wear it. It is a beautiful one of a kind necklace that can be worn with any outfit. I wear it with black to add a pop of color.